Calling brides of 2017 ! The Bridebook Wedding Awards 2018 are here! This is our chance to be recognised nationwide for all our hard work and achievements in 2017. 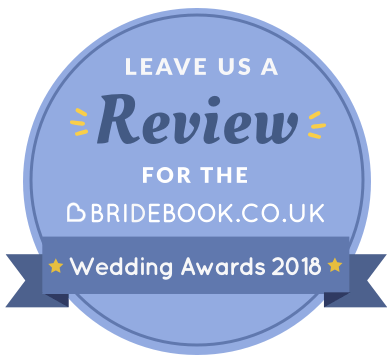 The Awards run from 1st November until December 15th and are the only UK wedding awards that that are both free to enter and are determined by reviews of past couples! I’m sure you all agree that reading a review before committing to most big purchases is common practise in today’s society and this is especially true when you are planning one of the most special and expensive events in your life- a wedding! The bride with no shoes – who arrived in the shop in a panic on the morning of her wedding to buy a pair of shoes because she still hadn’t got round to it, even though she had been in several times for fittings for the beautiful silk dress with puff sleeves we made her back in the 1990’s We are still friends to this day and now we ensure all brides bring their shoes for their dress fittings. Do as much as you can – together. Sewing something sentimental from a loved one into the dress. Helping brides find the right dress and then seeing their smile as their design comes to life during their fittings. 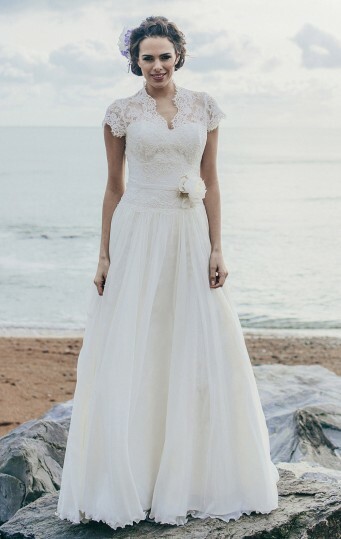 What is the best way to incorporate “Something Blue” into the wedding outfit? 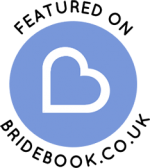 We use a blue Forget me Not pin from the Alzheimers association, and attach it to the petticoats in all our brides dresses, which is both our logo and the charity we support. At the end of every season we sell off some sample dresses to make room on the rails for our new 2018 designs. This year throughout the month of August we are having a "Name your Price Sale" Make us an offer price on selected Sale Samples and if we agree it, you can bag yourself a bargain. A few examples of dresses included in this promotion but there are plenty more to choose from. 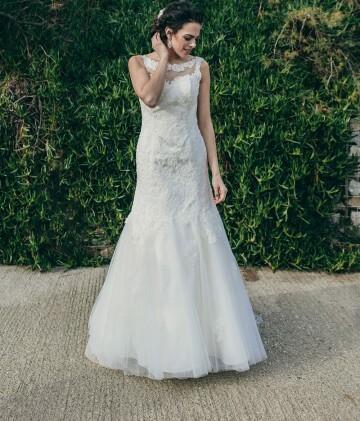 Over the weekend of April 6-10th there will be an opportunity by appointment, to try on our new collection of wedding dresses which have a modern, soft and willowy design element alongside traditional gowns. All with hidden corsetry to support and flatter your shape. In this modern age where we can easily have information at our fingertips, Looking up a review based on other peoples experiences, before making a big purchase is often the norm and makes a lot of sense. Not knowing my SEO from my Meta tags it is a bit out of my field but good old Customer service and going the extra yard for a bride is what we try and do on a daily basis. 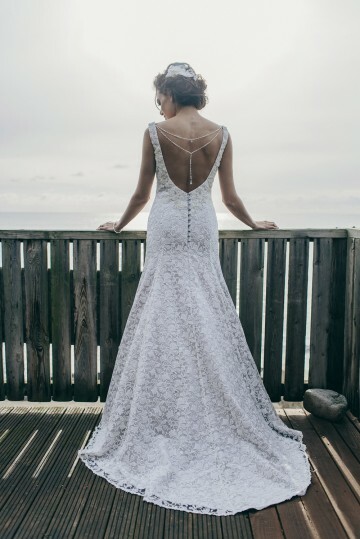 If you have recently visited us to have a look at our gowns or are already a Forget me Not bride old or new, We would appreciate it if you could leave us a review of your experience. We hope it will be a 5 Star review but if it’s not then at least we will learn from your comments and try and do better next time. 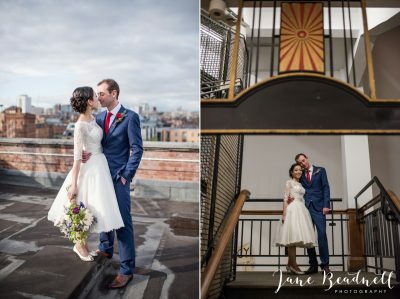 “Our photographer has just completed her blog on our wedding so please feel free to share on your page to see the beautiful Francesca dress in action! I absolutely adored my dress, it was so comfortable and fun to wear! Absolutely perfect for our vintage urban wedding. It also meant a lot to me that my dress was British designed and made,so a huge thank you to the talented team at Forget Me Not! 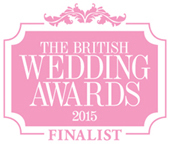 Best British Bridal collection category. All we need now is your votes to see if we can win this year. but only until 14th December so you haven't got long. Please spare 5 mins if you will to follow the link attached here. You will find us in the last category which is on page 15 of 16. If you had your eye on a Forget me Not design but thought it was beyond your budget, come back for another look. Samples have been tried on but not worn and some may benefit from dry cleaning. We can arrange for any alterations to be done for you at minimal cost. All Sale dresses and ex- samples are “Sold as Seen,” They must be checked thoroughly at time of purchase as there can be No Refunds, No Exchanges and No Returns. They must be paid for in full at the time of purchase and taken home. Any alterations can be organised at a later date and are charged separately. The Summer of Love is the theme for this years Bestival on the Isle of Wight and is very appropriate for this seasons weddings here at Forget me Not, many of which have been inspired by floral laces and soft colours. Out of the shades of pink, blue and green we introduced in this years collection it is the Pistachio Green that is proving to be a real hit. Julie wears a bespoke version of Adele in pistachio. We have many styles and soft shades of all colours to personalise your dress or theme. Such lovely comments received from last years brides on the voting forms for The Wedding Industry Awards- We must be doing something right! There are loads of comments but if you just read a few you will get the idea…..